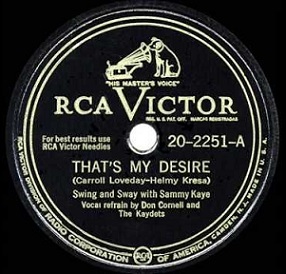 Sammy Kaye’s That’s My Desire tops Your Hit Parade and is nearing the end of its phenomenal seventeen week run in the Top Ten of Billboard‘s Pop Charts. One of the swing era’s most successful bandleaders, Sammy Kaye was a leader of the “sweet band” music… a less swinging style of big band jazz that was dominant in the early 1940’s. Though they incorporated the milder aspects of that into their music, they were really an outgrowth of the society bands of the 1920’s, specializing in elegant dance music without the frantic solos and showy musicianship, their appeal relegated to older sophisticated listeners who still made up a large segment of the music audience and classier nightclub patrons. Though it’s Kaye’s forty-first Top Ten hit the style itself is on the wane. Although his most remembered song is still yet to come, from 1948 through the end of his career he’d crack the Top Ten just eight more times as new styles of music overtook the old. As rock ‘n’ roll dawned this is the type of music, in terms of both theme and delivery, that was entrenched in popular culture. The American population tops 144 million people, only 44,000 of which have a television set. By contrast 40 million households have a radio, the still-dominant form of home entertainment. There were only two television networks in existence (NBC and Dumont) with fewer than a dozen programs between them for the entire week in prime time. The rest of the schedule was either local shows (centered largely in New York, as TV had barely penetrated other markets yet), newsreels, B-movies or test patterns. Boxing dominated the programming otherwise since it was relatively cheap to produce and appealed to those watching in bars, which is where the majority of TV sets were located. “In 1947 we saw our first television set. There was a bar adjacent to the Times-Herald (newspaper office) called The Showboat. The owners had a television on the bar. At six o’clock there was a news program… this was news that talked as well as moved and we were mesmerized! We were convinced this was the future.” – Eugene Jones, who along with his brother Charlie would soon revolutionize news reporting by taking their television cameras on assignment around the world for NBC News to capture stories visually which previously had only been written about. The average annual income for a working adult in 1947 is $2,850. 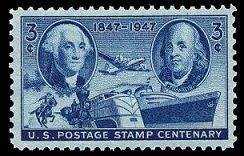 A US first class postage stamp costs 3 cents. 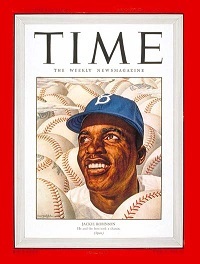 Jackie Robinson of the Brooklyn Dodgers wins the inaugural Rookie Of The Year Award in Major League Baseball. In April Robinson broke the onerous longstanding color line in the sport, thereby integrating America’s national pastime. Though initially met with protest by opposing players and threats of walkouts by entire organizations the league office vowed to severely reprimand any team that refused to take the field against the Dodgers which effectively curtailed any organized boycotts. Robinson however still faced daily verbal abuse from other players and fans yet his performance silenced all skeptics that suggested African-Americans did not have the skill required to compete in the Major Leagues. Robinson would go on to become the first black player to win a league MVP award as well as the first to be elected to the Baseball Hall Of Fame. RCA announces they’re coming out with a “large screen” video receiver (a/k/a – television set) whose screen will measure 15 by 20 inches. This is being pushed for “medium and large homes” as well as auditoriums! No word on whether they handed out binoculars for viewing in auditoriums. 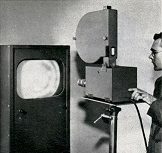 The Eastman Television Recording Camera is introduced enabling the filming of programs off the television screen in the studio itself. Though hardly practical and of low image quality these kinescopes became the only way to preserve live television productions until the advent of videotape in 1956. 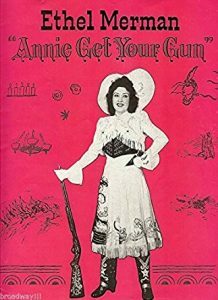 Lloyd Binford, head of the powerful Memphis Censor Board, bans the musical Annie Get Your Gun from being performed in the city due to having three minor black characters – a trainman, waiter and porter – among the cast, with Binford finding their mere presence on stage to be objectionable. Weeks earlier he’d banned the short film Curley due to the fact it portrayed children of different races playing together, telling United Artists who distributed the film, “The south does not permit Negroes in white schools, nor recognize social equality between the races, even in children“. Binford, possessing all of a 5th grade education, made the Memphis Censor Board the most powerful and feared in the nation while being viewed as a champion for white supremacy by racist politicians in the south. Fittingly the censor board, which he oversaw for 28 years, was later declared to be unconstitutional. Topps announces the production of a new bubble gum called Bazooka which will retail for a nickel and by 1953 will feature, as an added juvenile attraction, a miniature comic strip on each wrapper.